The goal of any soft shell crab recipe, in our opinion, is to gently augment the crab while basically just letting it shine, shine, shine. 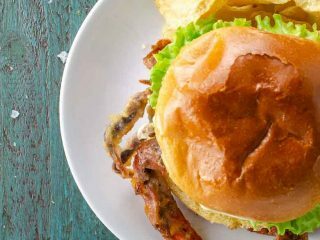 This soft shell crab sandwich keeps it simple in all the right ways. 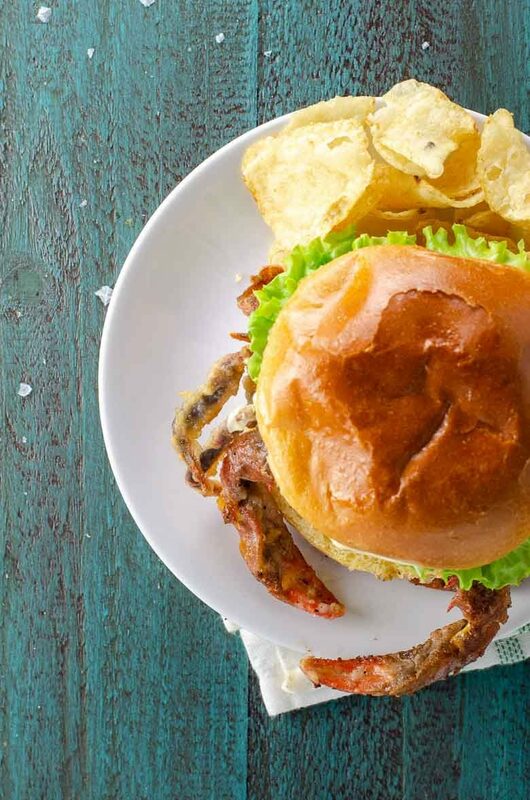 It utilizes just a few simple, good-quality ingredients — brioche bun, perfectly ripe tomato, soft leaf lettuce and Kewpie mayo (or regular mayo if you insist) — so the crab can take center stage. 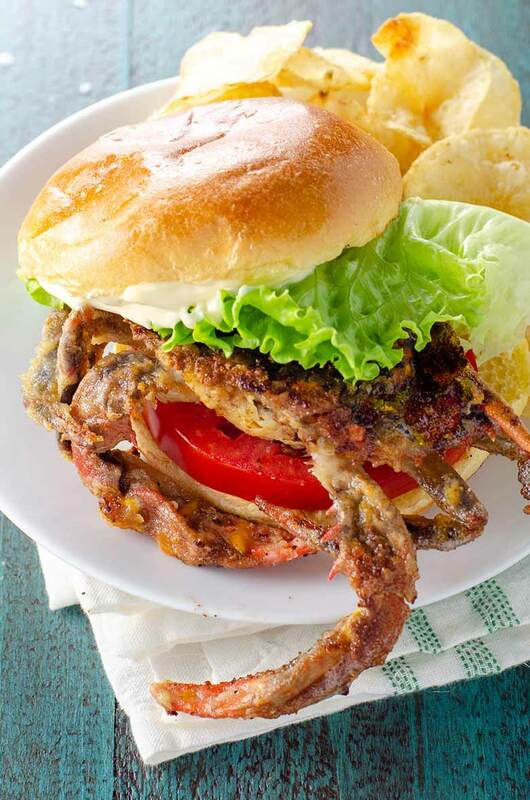 Soft shell crabs are like crabs and potato chips all in one. What could be better? And they're quick and easy to cook at home, promise. As for me, I've been the lady making awkward chit chat with the fish guy about how soft shell crabs are basically a cross between crabs and potato chips. Is it still called chit chat when you're the only one talking? The goal of any soft shell crab recipe, in my opinion, is to gently augment the crab while basically just letting it shine, shine, shine. This soft shell crab sandwich keeps it simple in all the right ways. It utilizes just a few simple, good-quality ingredients — brioche bun, perfectly ripe tomato, soft leaf lettuce and Kewpie mayo (or regular mayo if you insist) — so the crab can take center stage. Sprinkle some all-purpose flour onto a plate and dredge each crab through the flour until it’s lightly covered. Use a heavy 12-inch pan for nice, predictable, even cooking. I really like these simple and inexpensive seasoned Lodge cast iron skillets. They’re versatile and last forever. In a little oil (for its high smoke point) and a little melted butter (for flavor), you’ll cook the crabs over medium heat. Add the crabs belly up in a single layer. Cook for four minutes on the first side, then flip and cook for three minutes on the other side. They’ll be crisp and golden brown outside and perfectly cooked through on the inside. That’s it! The goal of any soft shell crab recipe, in our opinion, is to gently augment the crab while basically just letting it shine, shine, shine. This sandwich keeps it simple in all the right ways, utilizing just a few simple, good-quality ingredients so the crab can take center stage. Sprinkle the flour onto a plate and dredge each crab lightly in the flour. Heat butter and oil in a heavy 12-inch skillet over medium heat. Add the crabs belly up in a single layer. Cook for four minutes on the first side, then flip and cook for three minutes on the other side. Lightly toast brioche buns. I like to do this in the toaster oven, but you could do it right in the pan after removing the crabs if you like. Spread some Kewpie mayo (or regular mayo if you insist) onto the inside of the top bun. Layer tomato, soft shell crab, and lettuce onto bottom bun.